A charity for the homeless is the proud owner of one of Tolkien's tottering twin towers. It's a crumbling Grade II historical site built in 1758, with no bedrooms, and the new owner's a charity for the homeless; not what you'd call an easy match. 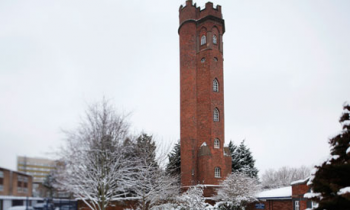 However the charity's boss is a Tolkien fanatic, and the tower in question is Perrott's Folly, one of the two Birmingham landmarks - along with Edgbaston Waterworks - said to be the inspiration for the Twin Towers of Lord of the Rings. So, in the end, Â£1 wasn't too much to pay, even though the restoration is likely to be a nightmare. Back in 2003 Perrott's Folly was listed as 'at risk', due to structural cracking that threatened to level it. The tower's passed through several charitable hands since Birmingham University parted with it back in the 1970s, but none of them really had the cash to do anything with it. Its current owner, Trident Reach the People, is a charity that provides housing for the homeless, and it's looking for Â£1 million to restore the Folly. An Artist in Residence, Lizzy Jordan, has already been installed, with a view to organizing community art projects to raise restoration cash. The intent is to eventually be able to open it to the public. Nobody knows why John Perrott built this evocative Folly. It might have been for the views, or to look out over at his wife's grave. There could even be a Masonic connection; hidden chambers and tunnels are rumored to exist beneath it. Since Perrott's time, the tower has been used as a meteorological station and astronomical observatory, before being more or less left to its own devices in 1979. In Tolkien's day - he lived nearby, and would have passed it every day on the way to school - it would have been owned by the Birmingham and Midland Institute of science and technology. Should you wish to donate some restoration funds, take a look over here. The fella you want to speak to is Ben Bradley, who has also - brave man - more than once given in to pleas from Tolkien fans begging to see Perrott's Folly. Bear in mind, should you wish to do the same, it is seven stories tall, with 139 steps, and he only has Saturdays free.